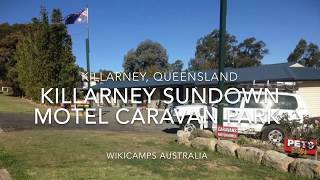 Located just off the main road of Killarney in Pine Street, situated near to the show, polocross, rodeo and recreation grounds, the Killarney Sundown Motel and Caravan Park is the place to stop and relax. New owners Ray and Leeonie are committed to providing guests with clean, comfortable and affordable accommodation. The Sundown Motel offers fully self-contained accommodation units that can accommodate up to 5 people and a cabin that accommodates 2 people. The Caravan Park has powered and un powered sites with clean amenities. Guests have the opportunity to use the Camp Kitchen with Wood Oven and Barbecue and outside is an open fire-pit which is perfect for group get together's. The Caravan Park has a laundry and is pet friendly (conditions apply). It is the perfect location to stop for the night after visiting the spectacular Queen Mary Falls. They are a five minute walk to shops, cafes and the pub. There is also an easy to use dump site. They are now a Kui Parks park, ask them about becoming a member. The park has 20 powered and unpowered sites and they are pet-friendly. They also have a camp kitchen, barbecue, laundry, WiFi and a dump site. Fully self-contained rooms with all kitchen and bathroom facilities plus digital television and wireless internet.